Lock in a great price for Monte Triana – rated 9 by recent guests! Everything about this hotel. In addition to the location and the facilities, the staff at all levels deserve a special mention for their friendliness and professionalism. The location in Triana couldn’t be better. It is just over the bridge from the bus station. The city bus which loops around Sevilla has a stop right outside the hotel. It was so easy to walk the Triana neighborhood and experience good restaurants and shops, but with locals instead of being surrounded by tourists. All staff at hotel did an amazing job assisting me as a single traveler. The desk clerks were exceptional, as were all the employees in the breakfast dining room. This hotel is perfect for a stay in Sevilla! This is a truly lovely hotel. The desk staff were very helpful and the room was spacious. We noted that the shower was not spotless and someone was sent when we left the room to clean it. Tirana turned out to be a great location from the alcazar and cathedral--an easy walk. There were also lots of wonderful small bars in area. The hotel also served a wonderful assortment of breakfast foods. Highly recommend the hotel to anyone who appreciates a top notch hotel for a very reasonable price. Excellent sized room with a big comfy bed. Large bathroom with a large walk in shower, all spotlessly clean and excellent working order. The staff are excellent, very helpful and friendly. The hotel is a few minutes walk from the river and some excellent bars and restaurants. It is about a 20 minute walk to the old town, but it's a pleasent walk. Very clean hotel. Location, albeit from most windows looks like a slum...it's actually amazing. Minutes away from great restaurants, tapas bars, pubs and quite a lot of night life. It is also very close to the old town, at maybe 15-20 minutes walk. Staff was really great and accomodating and the atmosphere was great. Highly recommended. We came with a rental car and parking in Spain's big cities can be a problem. This hotel has a parking space inside it. We asked whether our car could be parked some time after we checked out and (in November) the hotel was not booked to capacity so we could leave the car somewhat longer to enjoy Seville somewhat longer. Very comfortable, modern and clean. Pleasant, helpful staff. Great location. The staff was very helpful and within walking distance to the restaurants. There is a bus outside that can take you to the heart of the center attractions (Old Town). Our room was beautifully quiet and we appreciated extras like toothbrushes and paste, hairbrush, sponge and Twinings' teabags. Also, hotel very handy for the bus station, about ten minutes' walk. Monte Triana This rating is a reflection of how the property compares to the industry standard when it comes to price, facilities and services available. It's based on a self-evaluation by the property. Use this rating to help choose your stay! One of our top picks in Seville.The Hotel Monte Triana is located in Seville’s Triana district, about 15 minutes’ walk from the historic center. The bright, air-conditioned rooms have free Wi-Fi, pillow menu and digital TV. All rooms in the Monte Triana Hotel have wooden floors and a safe, most look onto the hotel’s typically Andalusian courtyard. 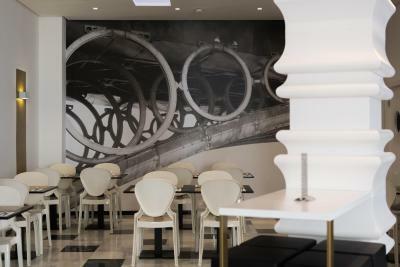 The hotel’s bar-café offers snacks and drinks. A varied breakfast is served daily, made with fresh products. Monte Triana has a free fitness center with gym facilities. 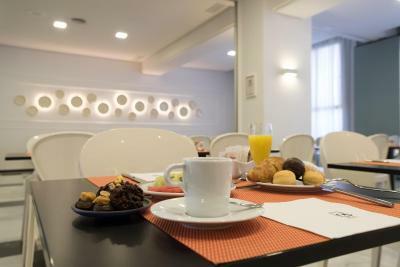 The attentive staff will be happy to help plan your stay in Seville, as well as arrange car hire. The Isla Mágica Theme Park is just under 10 minutes’ drive away. CaixaForum Sevilla is 2,300 feet from the property. 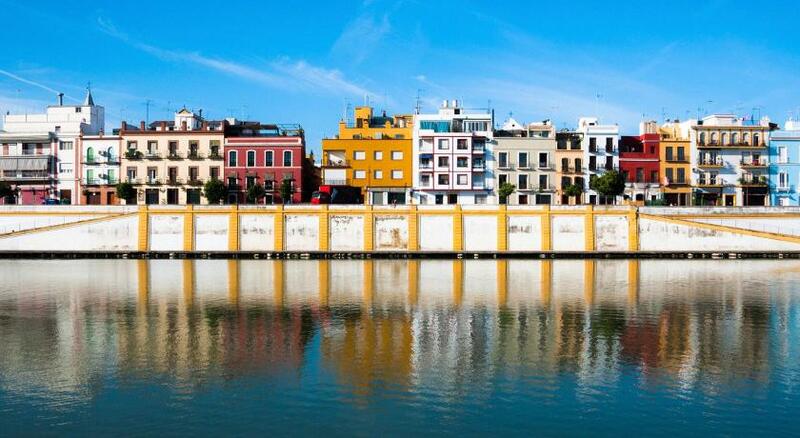 Triana is a great choice for travelers interested in city walks, ambiance and monuments. This property is also rated for the best value in Seville! Guests are getting more for their money when compared to other properties in this city. When would you like to stay at Monte Triana? Bright, air-conditioned rooms with free WiFi, pillow menu and flat-screen satellite TV. All have wooden floors, a safe and mini-bar. Most look onto the hotel’s typically Andalusian courtyard. *Please note that the maximum occupancy for this room is 2 guests, including children. This bright suite has a small seating area with a sofa and flat-screen TV. It includes air conditioning, free WiFi, a pillow menu, a safe and a mini-bar. This is a nonsmoking room. Bright, air-conditioned rooms with free Wi-Fi, pillow menu and flat-screen satellite TV. All have hardwood floors, a safe and minibar. Most look onto the hotel’s typically Andalusian courtyard. This room has a single bed of 100 x 6.6 ft. Extra beds and cribs cannot be accommodated in this room. This twin/double room has a satellite TV, air conditioning and mini-bar. 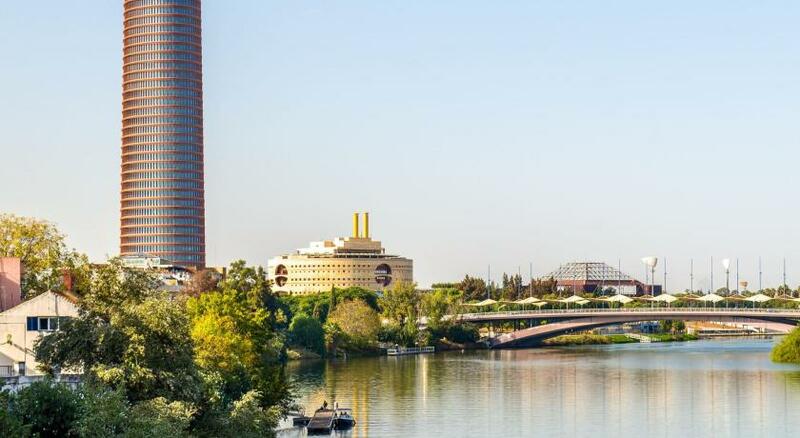 Hotel surroundings – This neighborhood is a great choice for travelers interested in city walks, ambiance and monuments – Check location Great location - show map Guests loved walking around the neighborhood! House Rules Monte Triana takes special requests – add in the next step! Monte Triana accepts these cards and reserves the right to temporarily hold an amount prior to arrival. Hotel in quiet location, especially for semana santa. Offered the opportunity to take short stroll into the processions, but also a peaceful retreat when wanting some friendly interaction with the locals. Receptionist Vanessa was amazing. She gave great advice regarding top places to visit and was extremely friendly. Also hotel catered for booking changes made last minute, without any hassle. Being a tourist, a lot of tour attractions and shopping areas are located the other side of the hotel. We were very impressed with the staff, the facilities, in fact everything. The room was very comfortable, the food plentiful and good, the staff very helpful and friendly. The staff were very good and highly knowledgeable. The location was perfect for us. A short walk accross the river to get to the centre. We liked being out of the tourist area and in a more authentic, creative place. Great restaurants very close by and wonderful ceramic museum and shops. Would definately go back. The price of the breakfast. Breakfast buffet tasteless and coffee not good at all. Shame. Very clean hotel. Spatious rooms. Friendly helpful staff. There were lots of options at breakfast with plenty fruit and juice but the options for hot food were not good. The bedroom had a kettle with facilities for making tea and coffee. There was a good selection of items and this was regularly refreshed. A lovely and elegant hotel. Staff were always friendly and helpful (great advice on best flamenco). The breakfast choices were good - lots of fresh fruit, fresh bread, hot buffet and a good coffee machine. We were on 4th floor with views across the city. And very close to the bars and nightlife of Triana.